Opportunity used its panoramic camera to take the images combined into this mosaic view of the rover. Power technologies provide more efficient and increased electricity to the spacecraft and its subsystems. 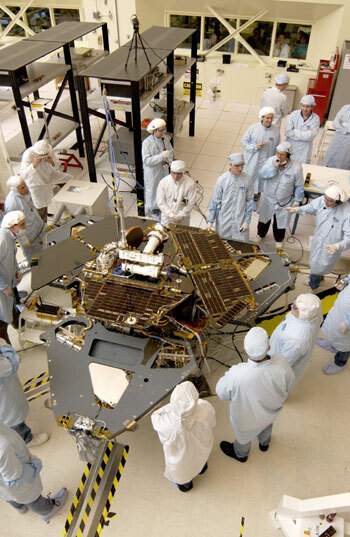 Evolving the flat, square solar panel from the Sojourner rover on the 1996 Mars Pathfinder mission into more powerful solar "wings"
This image is a bird's eye view of a group of engineers and technicians who are working on placing solar cells on the Spirit rover's 'wings' in JPL's spacecraft assembly facility. Like Mars Pathfinder, the Mars Exploration Rovers are solar-powered. Energy is absorbed through solar arrays on panels that sit atop what look like the rover's "wings." They were designed to maximize the area of solar cells that collect the sun's energy. Another innovation for the rovers is the addition of Triple Junction Gallium Arsenides. These three-layered solar cells made their first trip to Mars aboard the twin rovers. Used on NASA's Deep Space 1 mission, these cells are able to absorb more sunlight than the single cell versions sent on Sojourner. The solar cells are stacked in three layers on the rover's solar arrays and, because they absorb more sunlight, can supply more power to the rover's re-chargeable lithium batteries. 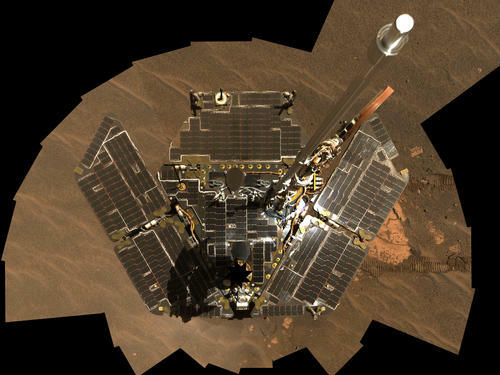 The Sojourner rover on the Pathfinder mission carried one 40-amp-hour lithium battery. The Mars Exploration Rovers carry two 8-amp-hour lithium batteries. During the rovers' prime missions, their solar arrays were able to produce about 900 watt-hours of energy per martian day, or sol. Well into the extended mission, efforts to drive Spirit and Opportunity strategically through and toward solar-rich areas is providing up to 410 watt-hours per martian sol. Using solar power limits the places on Mars that landed rover missions can explore. They are restricted to landing and traveling around the equatorial region where they can get enough sunlight to re-energize their batteries. For future missions, NASA is considering alternate power sources to increase the area on Mars that might be studied, opening up the whole planet to exploration.